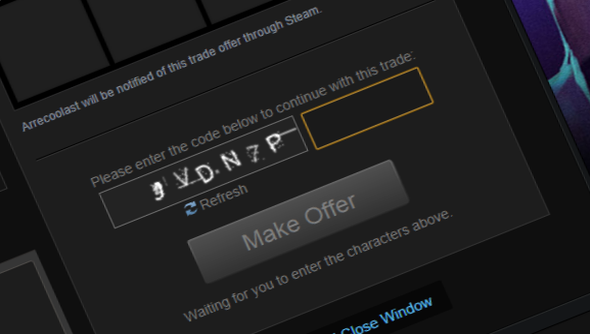 In another attempt to stop the bad guys getting away with it, Valve have added a new Captcha system to any and all Steam trade offers, to help prevent users from being swindled by nifty malware. Users will now need to type in the cryptic code displayed on each offer they submit. According to Valve, this is due to malicious malware being able to make trades on the users behalf, effectively cleaning out their accounts. Just over a month ago, Valve limited the ability to trade newly purchased games as gifts, making them untradable for thirty days after purchase. Today, further restrictions have been imposed in an effort to prevent hacking via a new method using malware. While Valve means well, the new system has had an undesired side effect. All current and pending trade offers have been canceled, angering many regular Steam traders. If you want to have your say about the new system, Valve are looking for input over on the Steam forums.